Drought ridden Alabama has endured several environmental disasters in the past few months, including extreme drought, drought induced wildfires, and a pipeline spill followed by a pipeline explosion. Last month’s Colonial Pipeline explosion left one dead, several severely injured, and ignited at least three wildfires — it is a disaster scene from hell. 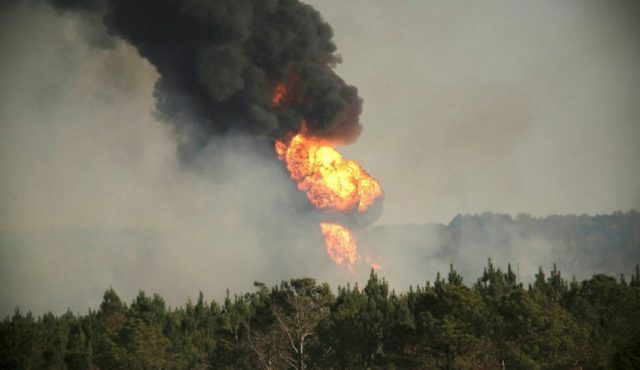 This explosion occurred south of Birmingham in rural Shelby County and was caused by recent work being done on the pipeline near the site of a leak that released an estimated 336,000 gallons of gasoline just two months prior. That leak resulted in the governors of both Alabama and Georgia declaring a state of emergency. Although local water samples collected show that the pollution has not reached the Cahaba River, there is still skepticism among nearby residents that the river was not at all impacted. Although the spill and explosion occurred in a rural and secluded area in the William R. Ireland Sr. Cahaba River Wildlife Management Area, the disaster was upstream of the Cahaba National Wildlife Refuge, home to five federally listed threatened or endangered species. The Cahaba River is Alabama’s longest free-flowing river and is highlighted by The Nature Conservancy as one of eight “Hotspots of Biodiversity” out of 2,111 watersheds nationwide. The pipeline, which is over 50 year-old, runs all the way from Texas to New Jersey, through the entire Southeast, and even has lines branching off into the Gulf of Mexico. The Fractracker Alliance produced a report and interactive map of Colonial Pipeline incidents based on data from the Pipeline and Hazardous Materials Safety Administration. This report found that from March 24th, 2010 to July 25th, 2016 there have been 125 incidents on the Colonial Pipeline, resulting in the release of 2,699.56 barrels of gas (113,381.52 U.S. gallons) costing a total of $31,814,811. These figures do not include the 336,000 gallons released in the incidents most recently occurring in Shelby County, Alabama. In Alabama, a life was lost. The environment and public health has been put in jeopardy at the hands of a pipeline that was constructed over 50 years ago — which is still affecting Alabamians in a very real way. Alabama is lucky that the spill was in a predominantly unpopulated area and that existing drought conditions and an aggressive clean-up crew prevented the spill from reaching the Cahaba river. This is not the reality for many communities affected by pipeline-related disasters. Other communities are not as lucky as Alabama and have to live with contaminated drinking water and polluted waterways. The man-made disasters that have recently occurred in Alabama bring into focus the haunting reality of the activities taking place in North Dakota. Indigenous water protectors have peacefully demanded that their ancestral land and lives not be exploited for yet another dangerous pipeline. However, they have been unfairly terrorized by a militarized police fleet. The construction of the Dakota Access Pipeline supports the continual investment in the oil and gas industry — rather than supporting a transition away from it to clean, renewable energy. Throughout every step in the process — extraction, processing, storage, transportation, and production — the oil and gas industry puts the environment and public health at risk and continues to deny indigenous peoples the opportunity, and the right, to have autonomy over their own land. Poor working class communities of the rural U.S. are finding that their water is flammable when turning on faucets, and that seismic activity in their community is tied to to the new and “safe technology” of hydraulic fracturing to extract natural gas. Pollutants emitted by the oil and gas industry contribute to the formation of smog, which disproportionately affects minority communities and triggers respiratory problems such as asthma, emphysema, and bronchitis. Africatown — Alabama, the community founded by the last shipment of slaves — is fighting tooth and nail to protect their community from hosting unwanted petroleum storage tanks. Communities are also dealing with the repercussions and dangers of the non-pipeline transportation of oil as they have to clean up after trains full of oil crash, spill, and explode — not to mention the emissions generated in other forms of transportation. The oil and gas industry is a significant contributor to climate change, which is already displacing folks around the world. Climate change means more heat strokes for urban dwellers, more floods, and more dangerous storms that the most vulnerable populations will suffer the most from. But the conversation does not end there. As much as this pipeline is about our dependency on fossil fuels and climate change, it is even more so about systemic racism and the continuing colonization of indigenous peoples. 1,172-miles of new pipeline means continuing to blatantly ignore what the Standing Rock Sioux have clearly demanded for their lives and land, and once again, intentionally putting indigenous people at a disproportionate risk for environmental and public health disaster. Another route that was considered for the pipeline would have affected a predominantly white area, but the current route was chosen after white residents spoke out on the risk to their drinking water. Unfortunately, this discrimination is nothing new. Indigenous peoples have continually dealt with the toxic legacy of environmental racism, violent colonization, and genocide — from the time white colonizers arrived in the Americas. So, from Alabama to North Dakota, pipelines are taking away lives. They are doing so by putting workers lives’ at risk to repair and clean-up man made disasters caused by pipelines, by polluting the land we depend on, by polluting the bodies of predominantly black, brown, and poor people, by contributing to climate change, which increases the frequency of destructive natural disasters that are killing and displacing the most vulnerable people in society, by using militant police forces to violently halt peaceful water protectors from defending their ancestral and sacred land and their right to clean water and by continuing the long and violent history of the colonization of indigenous peoples by stealing ancestral land only to be used as a sacrifice zone in the name of capitalism. Author: Morgan Pennington is a Federal Policy Intern at WE ACT for Environmental Justice, in their Washington, DC office. She is currently a student at the University of Montevallo. Her interests include the intersections between social and environmental issues, grassroots organizing, and social movements.